The new and improved formula is PH neutral and gentle on your wax or sealant. Ideal for the enthusiast that frequently washes their vehicle. Chemical Guys Wonder Wash is a revolutionary premium shampoo designed to work wonders on your vehicle’s paintwork. Utilizing advanced concentrated suspension technology, Wonder Wash lifts, breaks down and releases dirt particles from the vehicle’s surface. Micro-sized oxygen enriched bubbles trap dirt particles for easy removal that results in a clean, slick surface. Wonder Wash is 100% pH balanced making the wash solution safe on any surface. The unique formula is extra slick and perfect for gently removing dirt and grime. We designed Wonder Wash with oxygen infused technology that safely lifts dirt particles away from the paintwork. 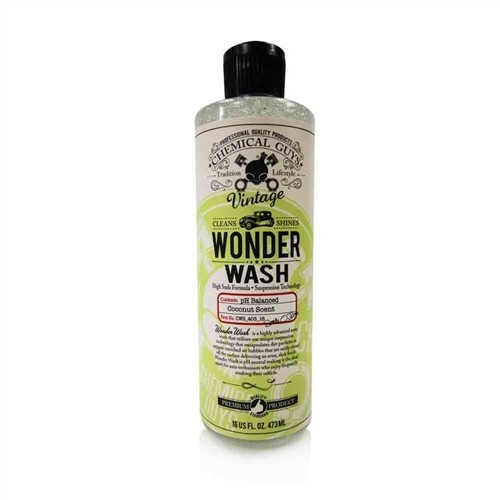 Wonder Wash is perfect for washing any vehicle and is safe to use in direct sunlight. Great for washing old and new cars while also maintaining your vehicle’s protective coat of wax or sealant. Wonder Wash creates a wonderful car wash experience and a brilliant shine. Add 1 oz. of Wonder Wash to 5 gallons of water. Rinse using clean water for perfect shine.